A friend and I were just talking about how we often use a Bible app on our phones instead of an actual Bible. I like the convenience and resources that come with the app, but I sometimes miss holding an actual Bible and taking notes in the margins. The other day I was needing some encouragement, so I picked up the CSB (in)courage Devotional Bible off my shelf. In those pages, I found real-life stories and unchanging truth that my soul needed to hear. I’m honored to have contributed a couple devotionals, but I’m more grateful for this resource in its entirety. And guess what! I’ve got one to give away, thanks to (in)courage. Just use the Rafflecopter widget below to enter to win before Friday, Jan. 25, when I randomly choose a winner. I’ve shared about this Bible before, but I’m grateful to have two devotions included. One is about how the Prince of Peace reconciles and rescues, based on some verses from Isaiah 9. The other is about God’s people dwelling together, taken from Ephesians 2. There are 312 devotionals written by 122 contributors, and they are organized into 10 devotional themes. Each theme has a distinct color and design to identify it throughout the Bible. In addition, each theme has a reading plan. The reading plans note title, page number, and the author of each devotion. In the back of the Bible, you’ll find a list of all contributors, their bios, and on which pages you can find their devotions. Additional custom features encourage women to explore the Bible and find their story through God’s story, plus journaling space at the bottom of each page. The Bible will be offered with four different covers with a variety of prices: white hardcover, blue leather touch, green fabric cover, and navy genuine leather. You can buy this beauty wherever Bibles are sold, including Amazon. Founded in 2009 by DaySpring, the Christian products subsidiary of Hallmark, the vision for (in)courage is to create a new home for the hearts of women, where women take turns pulling up a chair to share their stories of what Jesus looks like in their everyday, gloriously ordinary, often messy lives. 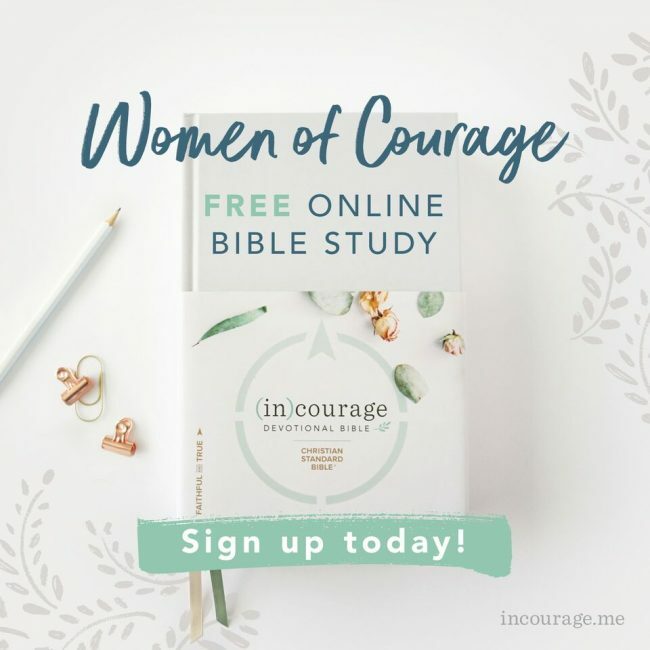 Since then, (in)courage has grown into a vibrant community that reaches thousands of women every day, sharing stories, loving support, and resources for meaningful connection. Our name represents DaySpring’s goal of bringing women into deeper community with Christ and with one another. The (in) means that we are in Christ, connected, and in community with each other. From all of this comes true courage. I’m grateful (in)courage is providing this additional copy of this Bible for me to share with you! I currently use the bible app most of the time but it feels so much less intimate than holding my bible and flipping through the pages. Can’t wait to check out this bible and the free study! Less intimate is a good way to describe it. I hope you enjoy this resource! I LOVE my journaling Bible from Zondervan best! Right now I most often use my Write the Word journal, which gives me a short section of Scripture to look up and write out for each day. I look up the Scriptures in my regular Bible so I guess that counts 🙂 I went through a phase of using the Bible app a lot. It was fun to connect with friends and see what others were highlighting, but I felt like I was reading on such a surface level and wasn’t internalizing the Word as deeply as when I used my physical Bible so for now I’m not on the app. Oh I didn’t even know people could connect on the app. That would be a huge distraction for me, but I do like the additional resources available right there as I’m reading scripture. I’ve heard good things about the Write the Word Journal. I’m glad you’re enjoying it. Thanks for being here. Thanks for being here, Gwendolyn! I use my Bible app every morning but am trying to get back in the habit of using my actual Bible instead of that (not that there is anything wrong with the app! It truly is awesome and I lovr the devotionals!). I am just more of a hard copy in my hand type of person! The app is so convenient too, but I know what you mean. I’m glad you’re here, Mary! I use an actual Bible – I LOVE my Key Word Study Bible and my NLT Study Bible. Study Bibles are usually the route I go too when I’m using an actual Bible. Glad you’re here today!